I felt much better today, probably because the sun was shining and I slept a bit better last night. 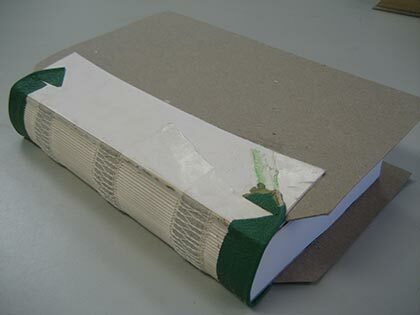 Plus, today was another adventure in bookbinding and I had so much fun. I took my camera to snap a couple of pictures of my book in progress. Take a look. I’m making a springback book which consists of 25 signatures which makes this a pretty hefty book. Here is a view of the sewn signatures. The cardboard pieces, which are much longer than the book will be trimmed later. The green leather pieces are the headbands I made. Next, I had to pare down the leather I plan to use to reinforce the spine. To do so, I used this machine and ran the strip of leather through until I got it pretty thin. This took a lot longer than I thought as it takes a bit of getting used to the motions you have to make. I was scared I was going to break through the leather. Let’s see how far I get into this next week. It was funny because I told my teacher I had to sign up for the next session which starts in two weeks because at the rate I’m going it will take me another full session to finish this book! ha,ha. oh, wow! that looks like a lot of fun! Thank you so much for posting pictures and I am very happy you are feeling better. How fun to see some of the steps in making your latest book. Thanks for sharing. Glad you’re feeling better. Wow that looks a bit technical! I’m enjoying the process. Thanks for sharing. I love it. I still would love to take a class like this. What will you use your book for when it’s done? 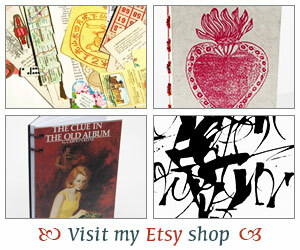 You really have to read the Dora Damage book–it talks a lot about bookbinding–I think you’d like it! I had no idea this was so complicated! I’m enjoying learning about this process from you. The tools look like instruments of torture. Is the finishing press yours? Book looks good as is. What are your plans for this book? I love it! So freakin’ cool. Thanks so much for showing us this process. I’m thinking of The Journal of Dora Damage as we “speak” (type). Bethany – It really is. Even when a project doesn’t quite come our right it’s still fun. tanabata – If I still don’t finish my book by next week I’ll try to show some more! Mrs S – Some books are really simple but this one has tons of steps. I’ll probably forget them all too – ha,ha. Danielle – I hope you can find a class or workshop near you one of these days. It’s something really fun to try out. I have got to get the Dora Damage book – I just can’t find it anywhere here. Isabel – Ha,ha… I hadn’t thought about that but I think you are right! 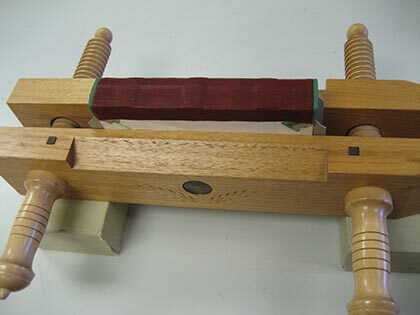 The finishing press belongs to the craft guild. My teacher had tons of leather scrap pieces so I didn’t have to pay more for that but it can be very expensive. No idea what I’ll use this book for yet. BTW : Love the title of the post. I love your book-making posts and I love when you share pictures of your projects. This looks like so much fun. Maybe someday when I have free time again I will sign up for a class. WOW — girl, that is looking so good. It is so interesting all the things you are learning…. and the results…fantastic! can’t wait to see this one finished.